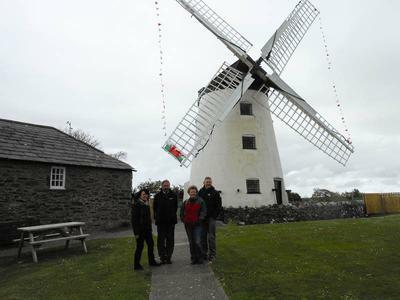 When competition winners came for their prize weekend on Anglesey (9-11 may 2014), the highlights were the people, the place, the natural environment and the produce. “I have met such nice and friendly people. Everyone is so polite and their smiles put a smile on my face. The day before I came to Anglesey was very stressful. I have now relaxed; the food, the lovely Tre-Ysgawen Hall hotel and the spa have all helped, but it has been the marvellous people we have met that have made my trip,” says Chris Ainsworth. Chris and Tom Ainsworth from the Wirral and Christine and Steve Dodd from Chester were welcomed on board the Virgin Train at Chester by Brendon Croud, Virgin Trains Project Manager for North Wales, who organised the competition. They enjoyed a first-class cooked breakfast en route to Holyhead. Alwyn Griffith, Celticos Tours, met them on arrival. 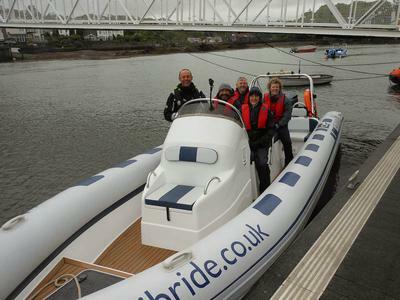 Alwyn provides regular sightseeing tours of Anglesey and arranges bespoke tours of the Island. 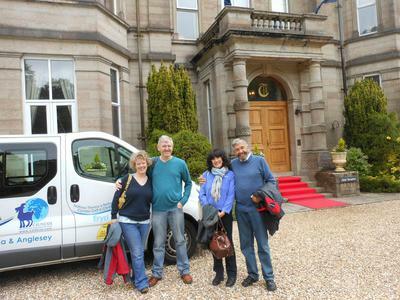 “Alwyn has been a great guide to Anglesey and so has everyone we met. The staff and volunteers we met at Oriel Ynys Môn, the RNLI Gwylfan Moelfre Seawatch Centre, The Copper Kingdom Centre, Swtan Heritage Museum and Llynnon Mill and the RibRide skipper have been so interesting and informative and very friendly,” says Chris. “I never knew there were so many little lanes to explore on Anglesey and so little traffic. We have travelled across the Island to catch the boat from Holyhead but now, having had a real opportunity to get off the well-beaten track, we have seen so much more,” says Tom Ainsworth. Travelling with Virgin Trains and Celticos Tours and having a fast and fun RibRide, the competition winners have got to see things from a different point of view. “It has been very relaxing not driving for the weekend. We have seen a lot, but the pace has been so relaxed it has been a real holiday,” says Tom. Hut Group. I liked the history and walking through the wild garlic and bluebells. It was a great nature experience and we enjoyed that. We are interested in nature, birdlife and plants, so this weekend has been great,” says Steve Dodd. The Tre-Ysgawen Hall hotel had organised a Hawk Walk where they were trained to handle the hawk and then flew the hawk through the woods. “I like bird watching, and walking with the hawk and seeing the Arctic Terns fishing alongside the RibRide boat was amazing. I used to own a motorbike, so I appreciated a fast and quick turn in the RIB combined with a bit of bird watching. It was fantastic,” says Steve. “I have really loved the tasting experiences and meeting the local producers too. We visited the Derimon Smokery and saw local meat being smoked, and at Y Cwt Caws we tasted local goats’ cheeses. I am very interested in the provenance of food. Meeting the cheese-maker and eating a special-selection cheese board at the hotel in the evening was a very nice experience,” says Christine Dodd. Local Anglesey produce was available for every meal at the Tre-Ysgawen Hall hotel and at Dylan’s Restaurant, Menai Bridge. “I have been to Anglesey for work, but we haven’t been around the Island. I have been impressed by the local produce and am taking a number of tasty treats home with me. Meeting the producers has been very interesting and the food has been absolutely lovely,” says Christine. Chris and Tom Ainsworth and Christine and Steve Dodd were the Virgin Trains’ Competition Winners. The prizes were provided by a partnership between Virgin Trains, Tre-Ysgawen Hall, Celticos, RibRide Adventure Boat Tours and Visit Anglesey. There is more information on the countryside, heritage, walking, coast and cycling on Anglesey available online at http://www.visitanglesey.co.uk/en. All the local businesses involved in this partnership warmly welcome you to Anglesey. You too can experience the people, the place, the natural environment and the produce to make you relax, smile and be inspired. Get Your Free Anglesey Newsletter here.